DJ Your Own Wedding?! It's not such a crazy thought anymore. 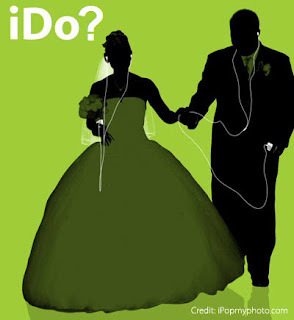 iPod weddings are becoming more popular these days and we understand that these economic times are calling for drastic measures. The cost for a professional wedding DJ may not be a top priority or part of your budget. Let's face it...sometimes music isn't that important to a couple. However, Elevated Pulse wants you to consider the following before deciding to be your own DJ at your wedding. • You will still incur costs. Unless you already own a great sound system, you’re going to have to rent one. This includes speakers, speaker stands, amplifiers, a sub woofer, cables, mixer, and wireless microphones for toasts and speeches. • Lighting equipment is a huge part of wedding decor —and without it you will have no ambiance on the dance floor! • You will most likely have to assign a friend or family member to move all the equipment, set it up, take it down, and it is a lot of work! And, if you are renting this equipment, you are fully responsible for it. • If you don't own all the music you and guests will want to hear, then add that to your unending list of "to-do's". And, this cost can add up...iTunes has raised prices to $1.29 per song now! • We are pretty sure an iPod can't read a crowd. Unless Apple has added "intuition" as a feature, you will definitely miss the energy and perfect timing a DJ can bring to the dance floor. With an iPod, you won't get beat-mixing and fading which without can lead to awkward moments on the dance floor as people have to stop dancing to wait for the next song. • The DJ serves as a master of ceremonies of sorts—so without the DJ you'll have to put a friend or family member to work again. If you've read all of the above and still can't justify the cost of a wedding DJ then please make sure you've covered every detail. Make sure you hold someone responsible for the playlist, equipment, and timeline of events. But remember, your wedding is one time in your life that you don’t want to skimp. It's supposed to be a celebration...a party! Don’t risk ruining it with an iPod.